Every Easter I love to gather the kids around and make some tasty treats. One of their favorite treats is sugar cookies. They love to decorate and eat them. While I love a good rolled sugar cookie with buttercream icing on it, my Mom’s sour cream cookies come to mind, my go to cookie is a thick rolled sugar cookie with royal icing on it. They are tasty and look great for gift giving. 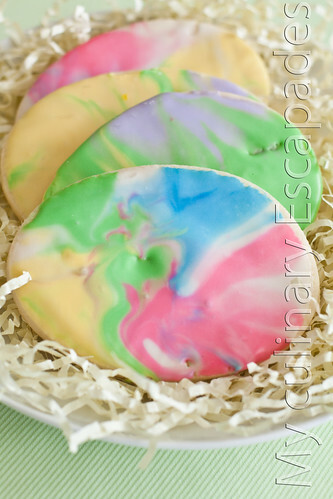 There are so many wonderful ways to flood cookies with royal icing and the ideas on how to cover an egg are limitless. One of my favorite ways to do Easter eggs is to do a tie dye effect. My royal icing recipe is unlike the majority of the ones found online. If you would like a more traditional royal icing Sweetopia has a great one. I have used it and it works perfectly as well. Cream the butter and sugar in the mixer. Add eggs and vanilla and mix until well incorporated. Mix dry ingredients in a separate bowl and add to the butter mixture. Mix the dough well. Dough will be very dry. Chill in large pancake shapes wrapped in plastic wrap for 1 to 2 hours. Preheat oven to 350 degrees. Line cookie sheets with parchment paper. This will keep your cookies from spreading and browning on the edges. One of the best tips I have ever acquired over my years of cooking go along with these cookies. Flour your rolling surface with powdered sugar not flour. This will create a nice sugar taste on the outside of your cookie rather than flour. Trust me, this will likely become your favorite tip of all time as well! Roll dough to 1/4 inch thickness and cut using your cookie cutters. Bake on baking sheet for 8 to 10 minutes or until the cookies are barely browning around the edges. Be careful to not over bake your cookies. Once you remove the pan from the oven allow cookies to cool for several minutes on the sheet so that they can firm up a bit. This recipe can make up to 5 dozen cookies depending on the size of the cutter. Put powdered sugar into a bowl. Add meringue powder, butter flavoring,vanilla, and 2 tablespoons water to start. Mix and check consistency. If still powdery add more water. Remember to add the water in small amounts because the frosting will turn into a liquid quickly. If you make it too watery add some more powdered sugar to achieve the desired consistency. To flood your cookies, like you will need to do this recipe, it needs to follow the Haniela’s 10 second rule. Outside of pure trial and error this video should help you see the consistency. Once your frosting is to the desired consistency you should divide it into smaller bowls and tint using your favorite tint. Make sure you leave some of the frosting white. Remember white is a color too. To make the cookies tie dye you will need some small plates. Spoon a pile of white icing onto your plate. Then put dollops of other colors on the plate. Run a toothpick through the mixture on the plate to mix colors a little. Hold cookie in your hand upside down and place the topside in the mixture. 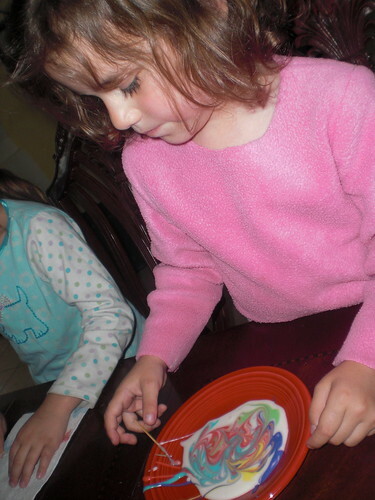 Here is a picture of my daughter mixing her colors on her plate. Pull cookie up straight and set down to dry. Repeat process on your plate until the plate is too messy. Start again with a fresh plate and continue the process. Have fun with it and enjoy the designs. Dry cookies overnight so that the icing sets and enjoy.